Chief of Army Staff, General Ashfaq Parvez Kayani visited Muzaffargarh Ranges today, to witness ongoing training exercises. 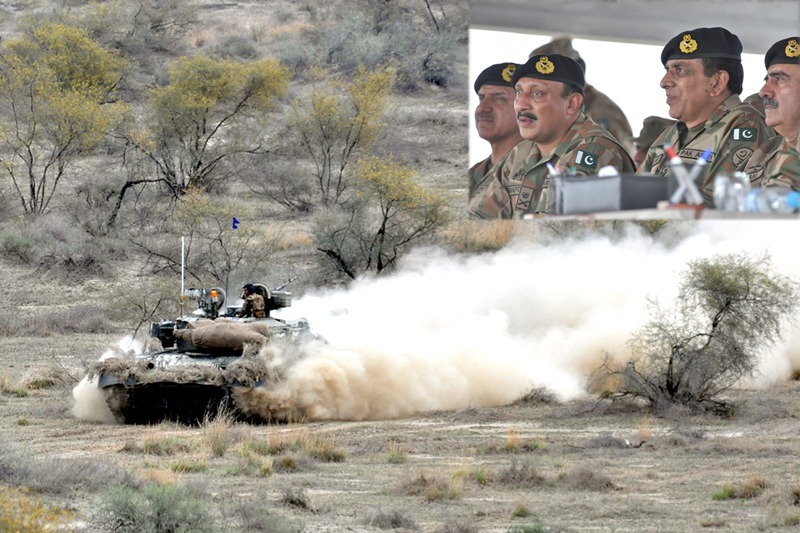 Chief of Army Staff, General Ashfaq Parvez Kayani witnessing training exercise at Muzaffargarh Ranges. The activities of the day comprised maneuvers of an armoured brigade group in conventional corps operations. PAF and Army Aviation elements provided close support to the maneuvering land forces. The modern battlefield was simulated by employment of UAVs for real time battle reconnaissance, along with state of the art data communication means. COAS appreciated the standard of training as well as various modifications indigenously carried out in field equipment, to make it more suitable to Pakistan Army’s needs. Earlier, COAS was received at Multan by Corps Commander Multan Corps, Lieutenant General Shafqaat Ahmed. This entry was posted in ISPR Press Releases, News and tagged Army Aviation, COAS, General Shafqaat, ISPR, Kayani, Multan Corps, Muzzafargarh Ranges, PAF, UAV. Bookmark the permalink.